Connor has soccer in his blood, as both of my parents have worked in youth soccer. HIs mother, Lisa has been a tournament director while his father, Bruce, has been a coach his entire life. As a result, Connor grew up on the field and has learned so many life lessons through the game. He adds, "I love soccer for this reason, because of how it prepares us for real life. I am thrilled and honored to have the opportunity to give back the club and the game that has taught me so much about life and coach youth players. Played for CASL (NC) & Lonestar USSF Development Academy growing up. After graduating high school, he went on to play 3 years at Mars Hill University, in Western North Carolina. After finishing his Bachelors, Connor played at Lynn University in Boca Raton, Florida while pursuing his Masters. 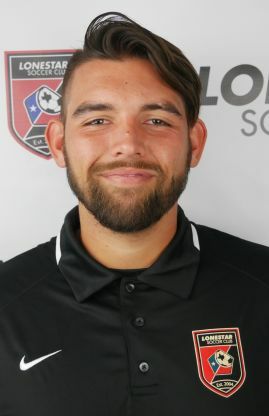 Connor has continued his playing career, playing for Houston FC in the PDL.